Another hugely disappointing day for England ended with further evidence that Jonathan Trott's game is in a mess. Called on to help steer England through to the close after an Australia declaration left England a target of 561, he once again got out to a dreadful shot as he was caught at deep square leg off Mitchell Johnson. The tourists ended the third day on 24-2, a monumental 537 runs behind Australia, and almost certainly on course for a heavy defeat. For so long, Trott has been the epitome of reliability for England - the foundation stone upon which many of their best batting displays were built. "I'm afraid Jonathan Trott has got to ask himself many questions. That was as bad an innings as I have seen from an England number three. He is all over the oche. For the first time in his career there is a big question mark over him." But his game began to unravel over the English summer and he now looks a pale imitation of the player whose unbeaten hundred on this very ground four years ago, in a record-breaking partnership with Alastair Cook, helped England save the Test and sapped the life out of the Australia attack. I interviewed him before the warm-up game in Hobart and he was talking about how hard he had worked to sort out his technique. He had been on a short holiday after the season at home and then gone straight to the nets to get his game in order. Well, he clearly didn't spend enough time working on a method against left-arm pace bowlers because he simply doesn't have a clue against Johnson at the moment. As soon as the Queenslander comes on to bowl, Trott seems to go into a nervous, skittish mode. He completely loses where he is on the crease and his head is so far away from the line of the ball. As any batsman knows, you have to have your head in line, but Trott's is so far across the line of off stump that he has no idea where the ball is. He is leaving his stumps exposed, so not only is he giving himself a very good chance of being dismissed on the leg side, he could also easily be bowled by a full ball at decent pace on his leg stump. As we know, Trott is a very intense character. We can see that at the crease when he goes through his torturous routine of taking guard, undoing his Velcro and doing it up again. The whole process is quite psychologically fraught. At the moment, his mind must be all over the place. He will be more upset than anybody about what is happening. Trott will also know that it is down to him to overcome this problem. He is not going to get over it by playing in a two-day game at Alice Springs next weekend, so between now and the second Test in Adelaide he is going to have to put in some intense work in the nets. 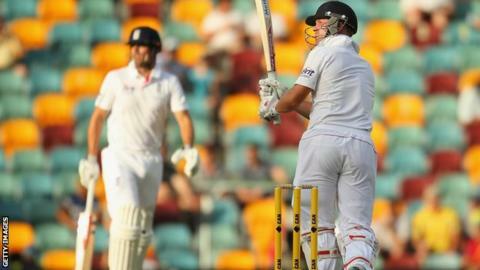 England will want to give Trott at least one more Test before considering his place in the side. The pitch in Adelaide is expected to be much slower, meaning Johnson should not be so much of a threat. They will hope that on a slow, low pitch, he can score some runs and get some confidence to take into the third Test, because if he plays like this on the fast track in Perth he is going to get bombed. Trott's form is definitely on the top of England's to-do list, but it is by no means the only area of concern for the tourists. Graeme Swann's figures of 27-2-135-2 tell the story of a player who is not bowling anywhere near his best. I was worried about him going into this game because he had not bowled enough overs in the warm-up games and several of the Australia batsmen managed to get on top of him on the third day. Australia know that England's tactics revolve around Swann holding down an end and offering control so that three seamers can be rotated at the other end. If he is going at five runs an over, it means James Anderson and Stuart Broad will need to bowl more and will tire more quickly. Since their recovery from 132-6 on day one, the Australians have ticked just about every box in this game. David Warner has scored runs, Michael Clarke has made a mockery of his supposed weakness to the short ball, England's vulnerable batting has been exposed, and Johnson has roared back into the Test arena. England will almost certainly lose this game, but there are still things they can gain from making Australia work hard for their victory. The remaining batsmen need to get some runs under their belt and try to get themselves in shape for the second Test - because this one is gone.